The largest outdoor sportsman's exposition in the north state, this is a very popular show and includes a free Youth Fair for kids 12 and under, including a large pond full of rainbow trout stocked by the CDFW. Anglers and hunters will be able to purchase their licenses for the year at the CDFW booth, where staff and wardens will also be available for questions and information. Trout Fishing for Youth: Receive some training and then try your hand at catching trout stocked in the wetlands pond on site. All supplies provided. Be sure to sign up for a spot when you arrive. The Fred Hall Del Mar Show is the first ever in the Central Valley, and also includes trout fishing supplied by CDFW and casting lessons for the kids. Everyone who fishes receives Fishing Passports, the California Fin Fish and Shellfish Identification book. All anglers who successfully catch a fish also receive a stamp in their passport books. The Fred Hall Long Beach Show is one of the top outdoor recreation shows around and features the largest selection of the nation's leading equipment manufacturers and industry leaders. It also includes trout fishing with beautiful rainbow trout supplied by CDFW and casting lessons for the kids. This is the largest outdoor sport fishing show in Southern California. Everyone who fishes receive Fishing Passports, the California Fin Fish and Shellfish Identification book. All anglers who successfully catch a fish also receive a stamp in their passport books. The Fred Hall Del Mar Show is a smaller version of the Long Beach show but also includes trout fishing supplied by CDFW and casting lessons for the kids. Everyone who fishes receives Fishing Passports, the California Fin Fish and Shellfish Identification book. All anglers who successfully catch a fish also receive a stamp in their passport books. The (38th) annual Port of San Diego's "Day at the Docks" is the West Coast's largest public celebration of sport fishing and signals the official start of Southern California's spring saltwater fishing season. A San Diego sport fishing tradition, Day at the Docks is held each year against the colorful and dynamic backdrop of the world-renowned sport fishing fleet on San Diego Bay, and attracts tens of thousands of fishing enthusiasts and families to the sport fishing landings in Point Loma. The event will run from 9:00 a.m. to 5:00 p.m. The last Saturday of April marks the opening of trout season in the Eastern Sierras, and with it come a multitude of trout-centered celebrations and activities in the Sierra towns of Bishop and Mammoth. This is great time to plan for your fishing or outdoor getaway weekend! Trout Fest is a hands-on, educational experience that introduces kids and families to the basics of trout fishing: from catching to cleaning to cooking. All activities are free and all equipment is provided. Enjoy instructions and demos on fishing pole rigging and knot tying, casting, dissection, fly tying, trout cleaning and more. California Fishing Passports are available to all attendees and fishing passport stamps are given for each new species caught. Open to everyone, 9:00 a.m. - 1:00 p.m. For more information, please call (559) 765-4824. The 31st Annual Kid's Fishing Festival is held in the high Sierras community of Mammoth Lakes at Snowcreek Resort between 8 a.m. - 1 p.m. As always, this California Fishing Passport event is hosted by the Town of Mammoth Lakes and is completely free. The trout fishing and catching is limited to kids 14 years of age and under, but there is always a full menu of events for everyone. More than 1,700 kids and adults attended last year and nearly every child caught a big fish! Loaner rods and reels are provided by CDFW's Fishing in the City program at no charge, if needed. Otherwise, kids are welcome to bring their own. The Berkley fishing tackle company provides all bait as well as some complete fishing rod and reel packages for prizes. CDFW fisheries staff and wildlife officers, Berkely Fishing Pro Staff and many other volunteer fishing guides are on-hand to provide helpful hands for all who needed it. In addition, CDFW staff provides Fishing Passports with official California Fishing Passport stamps (for all successful anglers), and California Finfish and Shellfish Identification books. The CDFW's Game Warden Recruitment Trailer that's full of beautiful animal and fish mounts from throughout California, and a living trout stream exhibit from CDFW's Hot Creek Hatchery are always on display. This is a great outing for families living in or visiting California's Eastern Sierras! This perpetual fishing event is FREE and open to boys and girls 16 years of age and under, and runs 8:00 a.m. to 12:00 p.m. Free bait, snacks and instruction are available to all. CDFW's Fishing in the City program provides instruction, bait, California Fishing Passports, passport stamps and California Finfish and Shellfish Identification books. Free loaner rods and reels are available if needed, or young anglers may bring their own. Prizes are awarded in many categories. The International Game Fish Association and the San Diego Sportfishing Council again join forces to host the 16th annual day of pier fishing from the Shelter Island Pier in San Diego. The event runs from 8:00 a.m. - 1:00 p.m. CDFW Natural Resources Volunteers will provide and stamp California Fishing Passports for young anglers as they reel in their catches. Last year, more than 200 kids (15 years and younger) and their families came out for this festive annual event. Trophies are awarded to winners in every age group, along with fishing rods, reels and tackle donated by sponsors. This is always a great event for young kids and families to all participate in together. Every year, the wildest and wackiest abalone cooks around gather at this event to vie for top honors. The free event runs from 11:30 a.m. to 4:00 p.m. (purchasing food is optional). This year, the focus is on raising awareness and funds to help eradicate the booming numbers of purple sea urchin off California's North Coast. Purple sea urchins are voracious consumers of kelp and are decimating northern California kelp forests, and red abalone are starving. While the abalone season is closed to help populations recover, cooks will use farmed abalone rather than wild red abalone. CDFW staff will be on hand to provide the latest information about the status of our red abalone populations, as well as California Fishing Passports, California Finfish and Shellfish Identification Books, and passport stamps. Come and enjoy some great music, participate in judging the cook-off (optional - ticket must be purchased), get your passport stamped, and learn more about how you can help this iconic North Coast gastropod in distress. The 55th Huck Finn Fishing Derby at the Huntington Beach Pier is always a fun event and continues to be one of our favorites to support each year. Seeing all of the kids fishing while cleverly dressed up as Huck Finn or Becky Thatcher is always a real highlight. All types of saltwater fish have been caught over the years including; sharks, stingrays, perch, croakers, sea bass, lizard fish, topsmelt, and sardines! The derby will run from 9:00 a.m. to noon (check in begins at 8:00 a.m.) and will be open to children between the ages of 4 to 15 to experience the fun of recreational fishing off the Huntington Beach Pier. CDFW provides loaner rods and bait, California Fishing Passports, fishing passport stamps and California Finfish and Shellfish Identification books. Prizes are awarded to both the largest and smallest fish caught, as well as the best dressed Huck Finn and Becky Thatcher participants. You do not want to miss out on this event! It's always a lot of fun for both children and adults alike. The 27th Annual California Kid's Fishing Derby on the Seal Beach Pier is free and open to kids to 15 years old and under. Children may either bring their own rods and reels or ask for a loaner. This is a catch, weigh and release event with prizes for the largest fish caught. CDFW staff provide some loaner rods and bait, California Fishing Passports, fishing passport stamps and California Finfish and Shellfish Identification books, and are available to answer any questions and help identify fish. Registration at the entrance to Seal Beach Pier runs 7:00 a.m. - 9:00 a.m. and fishing continues until 12:00 p.m. Free refreshments are provided. This event is a competition for chefs who will be creating their very best seafood recipes for you to taste, with an emphasis on sustainability: farm raised abalone, locally caught rockfish, uni (sea urchin gonad), seaweed and other surprises. The free event is held in south Noyo Harbor from 10:00 a.m. - 4:00 p.m. (fair vouchers can be purchased and exchanged for a variety of items, including food and drink). CDFW staff will be on hand to talk about the role we play in protecting and managing ocean resources for everyone's use and enjoyment, and to stamp and provide visitors with California Fishing Passports. Besides food and drink, this festive event includes lively music, a silent auction, and a craft fair. The largest outdoor sportsman's exposition in the north state, this is a very popular show and includes a free Youth Fair for kids 12 and under, including a large pond full of rainbow trout stocked by the CDFW. Everyone who fishes receives Fishing Passports, the California Fin Fish and Shellfish Identification book. All anglers who successfully catch a fish also receive a stamp in their passport books. Trout Fishing for Youth: Receive some training and then try your hand at catching trout stocked in the wetlands pond on site. All supplies provided. The Fred Hall Long Beach Show is one of the top outdoor recreation shows around and features the largest selection of the nation's leading equipment manufacturers and industry leaders. It also includes trout fishing with beautiful rainbow trout supplied by CDFW and casting lessons for the kids. This is the largest outdoor sport fishing show in Southern California. Everyone who fishes received Fishing Passports, the California Fin Fish and Shellfish Identification book. All anglers who successfully catch a fish also receive a stamp in their passport books. State hatcheries provide a vital service in maintaining the important recreational trout fishery. Come see what they do and experience all things trout! This FREE event will have fishing for kids 15 and under, lessons on casting and cleaning and cooking your catch, crafts, dissections and microscope exhibits, a trout touch pool, trout tastings, fish feeding, and more! The (38th) annual Port of San Diego's "Day at the Docks" is the West Coast's largest public celebration of sport fishing and signals the official start of Southern California's spring saltwater fishing season. A San Diego sport fishing tradition, Day at the Docks is held each year against the colorful and dynamic backdrop of the world-renowned sport fishing fleet on San Diego Bay, and attracts tens of thousands of fishing enthusiasts and families to the sport fishing landings in Point Loma. Monterey Bay Youth Outdoor Day is a totally free event open to the public. The focus is to get kids interested and involved in the many outdoor activities available right in our own back yards. CDFW's California Fishing Passport program quizzes kids on different aspects of sport fish and fishing, gives attendees California Fishing Passports and California Finfish and Shellfish Identification books, and provides fishing, hunting and wildlife viewing information. With over 40 different organizations represented, there is something for everyone! The event runs from 10:00 a.m. to 4:00 p.m. at the Santa Cruz County Fairgrounds. To kick off National Fishing Week, the city of Chico will be welcoming kids to an outstanding free “Hooked on Fishing, not on Drugs”, an American Sportfishing Association event. It is one of the largest single-day children’s fishing events in the entire United States! Kids 15 and under are invited to come to Horseshoe Lake in Upper Bidwell Park from 7:00 a.m. to Noon on Saturday, May 20, for a chance at the 8,000 pounds of channel catfish that will be planted for the event. Admission is FREE, along with all tackle, bait, and instruction (limit 1 fish per child). Kids can even have their catfish cleaned for free. Since this is a “kids only” lake, no fishing license is required for anglers under 16. Expert local anglers will be on hand as coaches. There will be a separate area for the littlest anglers, age 1 to 5. There will be plenty of rods and reels available to use free, but all are encouraged to bring their own. Bring your favorite “secret” catfish bait, but please, no lead sinkers at Horseshoe Lake. With all that help and all those fish, it will be the closest thing to a guaranteed “first fish” for the little ones. To donate, volunteer, or for more information, call (530) 891-4757. A great time is sure to be had by all. Come out from 7:30-10:30 in the morning for this free event. Prizes will be available to kids 15 and under, and local anglers will be on hand providing tips and instruction. Make sure to bring your own rod, reel and tackle! For more event information, call (951) 471-1212. The California Fishing Passport program's educational Fishing and the Ocean Workshop is designed to help new anglers get started fishing. Participants learn from marine scientists about ocean conservation, fish identification, regulations, safety and more. Then local fishing pros teach the fishing skills and techniques needed to help them become successful anglers. On the first day we teach participants what they need to know, and on the second day we take them fishing so that they can put all of their new knowledge and skills into practice. All ages are welcome! If you are new to fishing, ocean angling or fishing in California, then this workshop is for you! Visit our California Fishing and the Ocean Workshops page for more information. The fourth annual Mammoth Lakes area, "Trout Fest" is a free, fun-filled day loaded with lots of fishing activities and fascinating information about California native trout. California Fishing Passports were provided to all attendees and fishing passport stamps are given for each new species caught. Open to everyone! For more information, please call (559) 765-4824. CDFW's California Fishing Passport Program joins hosts "Friends of Rollo" for another trip aboard the F/V Dana Pride out of Dana Wharf Landing in Dana Point. "Friends of Rollo" is a non-profit organization headquartered in San Diego with a charter to introduce more kids and families to ocean fishing adventures through a complimentary deep sea fishing trip. CDFW's Fishing Passport staff provide California Fishing Passports to everyone, as well as stamps for each fish caught. "Friends of Rollo" have helped take more than 100,000 kids out fishing! The California Fishing Passport program's fishing and ocean educational workshop is designed to help new anglers get started fishing. Participants learn from marine scientists about ocean conservation, fish identification, regulations, safety and more. Then local fishing pros teach the fishing skills and techniques needed to help them become successful anglers. On the first day we teach participants what they need to know, and on the second day we take them fishing so that they can put all of their new knowledge and skills into practice. All ages are welcome! If you are new to fishing, ocean angling or fishing in California, then this workshop is for you! Visit our California Fishing and the Ocean Workshops page for more information. "Fish for Life!" is a wonderful non-profit organization headquartered in Southern California with a charter to enhance the lives of special needs individuals by inviting them out on the water to enjoy a complimentary deep sea fishing trip. CDFW's California Fishing Passport Program joins them aboard the F/V Dana Pride out of Dana Wharf Sportfishing equipped with California Fishing Passports for everyone, and stamps for each fish caught. These "Fish for Life!" trips are some of the most unique and special events held all year. This organization is designed to provide love and inspiration to a multitude of special needs people while teaching fishing skills and ministering to the value of life. Their motto: "We're Spreading the Love One Boat at a Time!" The 30th Annual Kid's Fishing Festival is held in the high Sierras community of Mammoth Lakes at Snowcreek Resort between 8 a.m. - 1 p.m. As always, this California Fishing Passport event is hosted by the Town of Mammoth Lakes and is completely free. The trout fishing and catching is limited to kids 14 years of age and under, but there is always a full menu of events for everyone. More than 1,700 kids and adults attended last year and nearly every child caught a big fish! Loaner rods and reels are provided by CDFW's Fishing in the City program at no charge, if needed. Otherwise, kids are welcome to bring their own. The Berkley fishing tackle company provides all bait as well as some complete fishing rod and reel packages for prizes. CDFW fisheries staff and wildlife officers, Berkely Fishing Pro Staff and many other volunteer fishing guides are on-hand to provide helpful hands for all who needed it. In addition, CDFW staff provides Fishing Passports with official California Fishing Passport stamps (for all successful anglers), California Finfish and Shellfish Identification books, junior fishing licenses and posters. The beautiful CDFW's Game Warden Recruitment Trailer that's full of beautiful animal and fish mounts from throughout California, and a living trout stream exhibit from CDFW's Hot Creek Hatchery are always on display. This is a great outing for families living in or visiting California's Eastern Sierras! "Fish for Life!" is a wonderful non-profit organization headquartered in Southern California with a charter to enhance the lives of special needs individuals by inviting them out on the water to enjoy a complimentary deep sea fishing trip. CDFW's California Fishing Passport Program joins them out of Long Beach equipped with California Fishing Passports for everyone, and stamps for each fish caught. These "Fish for Life!" trips are some of the most unique and special events held all year. This organization is designed to provide love and inspiration to a multitude of special needs people while teaching fishing skills and ministering to the value of life. Their motto: "We're Spreading the Love One Boat at a Time!" The California Fishing Passport program's fishing and ocean educational workshop is designed to help new anglers get started fishing. Participants learn from marine scientists about ocean conservation, fish identification, regulations, safety and more. Then local fishing pros teach the fishing skills and techniques needed to help them become successful anglers. On the first day we teach participants what they need to know, and on the second day we take them fishing so that they can put all of their new knowledge and skills into practice. All ages are welcome. If you are new to fishing, ocean angling or fishing in California, then this workshop is for you! Visit our California Fishing and the Ocean Workshops page for more information. Photos Available: Day 1 Instruction, Day 2 Pier Fishing and Boat Fishing. The California Fishing Passport Program again joins forces with the International Game Fish Association and the San Diego Sportfishing Council to host the 15th annual day of pier fishing from the Shelter Island Pier in San Diego. The event runs from 8:00 a.m. - 1:00 p.m. Last year, more than 200 kids (15 years and younger) and their families came out for this festive annual event. Free lunches of hot dogs and tacos are served to all. Trophies are awarded to winners in every age group, along with fishing rods, reels and tackle donated by sponsors. California Fishing Passports and California Finfish and Shellfish Identification books are provided to all participants, and passports are stamped for each type of fish caught. This is always a great event for young kids and families to all participate in together. The 54th Huck Finn Fishing Derby at the Huntington Beach Pier is always a fun event and continues to be one of our favorites to support each year. Seeing all of the kids fishing while cleverly dressed up as Huck Finn or Becky Thatcher is always a real highlight. All types of saltwater fish have been caught over the years including; sharks, stingrays, perch, croakers, sea bass, lizard fish, topsmelt, and sardines! The derby will run from 9am to noon (check in begins at 8am) and will be open to children between the ages of 4 to 15 to experience the fun of recreational fishing off the Huntington Beach Pier. CDFW provides loaner rods and bait, California Fishing Passports, fishing passport stamps and California Finfish and Shellfish Identification books. Prizes are awarded to both the largest and smallest fish caught, as well as the best dressed Huck Finn and Becky Thatcher participants. If you missed this special event last year, please try to attend this year. It's always a lot of fun for both children and adults alike. CDFW's California Fishing Passport program again joins the International Game Fish Association and the United Pier & Shore Anglers of California for their sixth Young Angler Tournament series event of the year at the Marin Rod and Gun Club Pier. Youth from throughout the San Francisco Bay Area attend this fun event. CDFW's California Fishing Passport program gives each participant a California Fishing Passport, and California Finfish and Shellfish Identification book, and stamps for each of the different species caught. Last year these included leopard sharks, sea perch and jacksmelt, among others. Trophies are awarded to the winning participants in each age group. In addition to a free hot dog lunch, donated prizes of rods and reels are distributed to each participant during this fun day of fishing on San Francisco Bay. The 26th Annual California Kid's Fishing Derby on the Seal Beach Pier is free and open to kids to 15 years old and under. Children may either bring their own rods and reels or ask for a loaner. This is a catch, weigh and release event with prizes for the largest fish caught. CDFW reps provide some loaner rods and bait, California Fishing Passports, fishing passport stamps and California Finfish and Shellfish Identification books and are available to answer any questions and help identify fish. Registration at the entrance to Seal Beach Pier runs 7:00 - 9:00 a.m. and fishing continues until 12:00 p.m. Free refreshments are provided. Photos Available: Day 1 Instruction, Day 2 Pier Fishing and More Day 2 Pier Fishing. CDFW's California Fishing Passport program joins the International Game Fish Association and the United Pier & Shore Anglers of California for their Young Angler Tournament series event at the Trinidad Pier in Humboldt County. Youth from throughout the Humboldt and Del Norte Counties attend this fun event. CDFW's California Fishing Passport program gives each participant a California Fishing Passport, California Finfish and Shellfish Identification book, as well as stamps for each of the different species caught. Trophies are awarded to the winning anglers in each age group. A free hot dog lunch is provided to each participant and lots of raffle prizes will be given away during this fun day of fishing on the northern California coast. The event begins at 1:00 p.m.
18th Annual Orvill P. Ball Memorial "Fishin' in the Pines"
This is a free kids derby open to kids up to age 15. Trout fishing starts at 6:00 a.m. and a free lunch is prepared by the San Diego Anglers Club. The event is sponsored by the Lake Cuyamaca Recreation and Park District, 15027 Highway 79, Julian, CA 92036. This annual salmon festival is a free, fun-filled day loaded with lots of fishing activities and fascinating information about California salmon. The festival runs 9:00 a.m. to 4:00 p.m.. California Fishing Passports are provided to all attendees and fishing passport stamps are given for each new species caught. Open to everyone! For more information, please call (530) 365-8622. This event coincides with lobster season and features local commercial fishermen offering the Santa Barbara Channel's freshest seafood. Fishermen and seafood vendors provide thousands of festival-goers with live lobster, crab, prawns, BBQ albacore, clam chowder, fish tacos, seafood gumbo and other prepared dishes. CDFW is on hand to answer questions, stamp and provide California Fishing Passports, and display the latest landing statistics for ocean resources near Santa Barbara. A large variety of vendors offer their wares, the Maritime Museum shows films and exhibits, and touch tanks with live fish and invertebrates are available, in addition to tall ship tours, free boat rides, live local entertainment, and dockside tours. The largest outdoor sportsmen's exposition in the north state, this is a very popular show and includes a free Youth Fair for kids 12 and under, including a large pond full of rainbow trout stocked by the CDFW. Everyone who fishes receives Fishing Passports, the California Fin Fish and Shellfish Identification book. All anglers who successfully catch a fish also receive a stamp in their passport books. The (37th) annual Port of San Diego's "Day at the Docks" is the West Coast's largest public celebration of sport fishing and signals the official start of Southern California's spring saltwater fishing season. A San Diego sport fishing tradition, Day at the Docks is held each year against the colorful and dynamic backdrop of the world-renowned sport fishing fleet on San Diego Bay, and attracts tens of thousands of fishing enthusiasts and families to the sport fishing landings in Point Loma. Monterey Bay Youth Outdoor Day is a totally free event open to the public. The focus is to get kids interested and involved in the many outdoor activities available right in our own back yards. CDFW's California Fishing Passport program quizzes kids on different aspects of sport fish and fishing, gives attendees California Fishing Passports and California Finfish and Shellfish Identification books, and provides fishing, hunting and wildlife viewing information. With over 40 different organizations represented, there is something for everyone! The event runs from 10:00 AM to 4:00 PM at the Santa Cruz County Fairgrounds. The third annual Mammoth Lakes area, "Trout Fest" was a free, fun-filled day loaded with lots of fishing activities and fascinating information about California native trout. California Fishing Passports were provided to all attendees and fishing passport stamps were given for each new species caught. Open to everyone! For more information, please call (559) 765-4824. This annual event is held as a fundraiser for the Salmon Restoration Association, which helps to fund watershed restoration efforts. Attendees learn about salmon habitat restoration and other local conservation efforts, and indulge in some fish printing! Hundreds of attendees from all over northern California come out to contribute to a worthy cause, eat great BBQ, and listen to some fun music. CDFW's California Fishing Passports are provided and stamped! CDFW's California Fishing Passport program again joins the International Game Fish Association and the United Pier & Shore Anglers of California for their fifth Young Angler Tournament series event of the year at the Marin Rod and Gun Club Pier. Youth from throughout the San Francisco Bay Area attend this fun event. CDFW's California Fishing Passport program gives each participant a California Fishing Passport, and California Finfish and Shellfish Identification book, and stamps for each of the different species caught. Last year these included leopard sharks, sea perch and jacksmelt, among others. Trophies are awarded to the winning participants in each age group. In addition to a free hot dog lunch, donated prizes of rods and reels are distributed to each participant during this fun day of fishing on San Francisco Bay. The 29th Annual Kid's Fishing Festival was again held in the high Sierras community of Mammoth Lakes at Snowcreek Resort on Saturday, July 30 from 8am to 1pm. As always, this California Fishing Passport event was hosted by the Town of Mammoth Lakes and was completely free. The trout fishing and catching was limited to kids 14 years of age and under but there was a full menu of events for everyone. More than 1,700 kids and adults attended this year and nearly every child caught a big fish! Loaner rods and reels were provided by CDFW's Fishing in the City program at no charge, while some people brought their own. The Berkley fishing tackle company provided all bait as well as some complete fishing rod and reel packages for prizes. CDFW fisheries staff and wildlife officers, Berkely Fishing Pro Staff and many other volunteer fishing guides were onhand to provide helpful hands for all who needed it. In addition, CDFW staff provided Fishing Passports with official California Fishing Passport stamps (for all successful anglers), California Finfish and Shellfish Identification books, junior fishing licenses and posters. The beautiful CDFW's Game Warden Recruitment Trailer that's full of beautiful animal and fish mounts from throughout California, and a living trout stream exhibit from CDFW's Hot Creek Hatchery were on display. This was another great outing for families living in or visiting California's Eastern Sierras! This perpetual fishing event was again FREE and open to boys and girls 16 years of age and under and ran 8am to 12pm. Free bait, snacks and instruction were available to all. CDFW provided loaner rods and bait, California Fishing Passports, passport stamps and California Finfish and Shellfish Identification books. Participants were also welcome to bring their own rods and reels to use. Prizes were awarded in many categories and everyone went home a winner. This annual event celebrates the Point Arena-Stornetta unit of the California Coastal National Monument. Visitors can hike the coastal Discovery Trail and learn about coastal issues from docents stationed along the way, visit the Mendocino college Coastal Field Station, tour the Point Arena Lighthouse, and learn all about coastal conservation and ocean-related issues from displays at the information booths of various state, federal, and local organizations. CDFW's information table was located at the south entrance to the Discovery Trail, in Point Arena City Hall. CDFW California Fishing Passports and Fishing Passport Stamps were provided. The 53rd Huck Finn Fishing Derby at the Huntington Beach Pier, as always, was a fun event and continues to be one of our favorites to support each year. Seeing all of the kids fishing while cleverly dressed up as Huck Finn or Becky Thatcher is always a real highlight. Last year's event brought in more than 600 kids and their families. All types of saltwater fish have been caught over the years including; sharks, stingrays, perch, croakers, sea bass, lizard fish, topsmelt, and sardines! The derby ran from 9am to noon (check in began at 8am) and was open to children between the ages of 4 to 15 to experience the fun of recreational fishing off the Huntington Beach Pier. CDFW provided loaner rods and bait, California Fishing Passports, passport stamps and California Finfish and Shellfish Identification books. Prizes were awarded to both the largest and smallest fish caught, as well as the best dressed Huck Finn and Becky Thatcher participants. If you missed this special event this year, please try to attend next year. It's always a lot of fun for both children and adults alike. The California Fishing Passport Program again joined forces with the International Game Fish Association and the San Diego Sportfishing Council to host the 14th annual day of pier fishing from the Shelter Island Pier in San Diego. The event ran from 8am - 1pm. More than 200 kids (15 years and younger) and their families came out for this festive annual event. Free lunches of hot dogs and tacos were served to all. Trophies were awarded to winners in every age group, along with fishing rods, reels and tackle donated by sponsors. California Fishing Passports and California Finfish and Shellfish Identification books were provided to all participants, and passports were stamped for each type of fish caught. As usual, it was a great event for young kids and families to all participate in together. The 25th Annual California Kid's Fishing Derby on the Seal Beach Pier was free and open to kids to 15 years old and under. Children either brought their own rods and reels or asked for a loaner. This was a catch, weigh and release event with prizes for the largest fish caught. California Department of Fish and Wildlife reps provided some loaner rods and bait, California Fishing Passports, passport stamps and California Finfish and Shellfish Identification books and were available to answer any questions and help identify fish. Registration at the entrance to Seal Beach Pier ran 7-9am and fishing continued until 12pm. Free refreshments were also provided. This was a chartered deep sea fishing trip for USMC military members (who had returned from active duty overseas) and their families to enjoy a day of fishing together off Point Loma in San Diego. CDFW's California Fishing Passport Program staff joined them aboard the F/V New Seaforth out of Seaforth Landing to teach all of the passengers about the fish they were catching and to provide California Fishing Passports and Finfish and Shellfish Identification books, and official Passport stamps for everyone who caught fish. At the end of the trip, those with the most stamps (indicating the most species of fish caught) were given complimentary San Diego Padres baseball game tickets provided by Randy Jones, a Cy Young award winning pitcher for the San Diego Padres. The trip was sponsored by the "Randy Jones Foundation" - an all volunteer non-profit organization whose mission is to provide kids from military families the opportunity and resources to get involved in sporting and outdoor activities - and "Friends of Rollo." CDFW's California Fishing Passport Program will also partner with Friends of Rollo and Boy Scout Troop 324 to take anglers out for a fishing trip aboard the F/V Daily Double out of Point Loma Sportfishing. Each angler will receive a California Fishing Passport and stamps for each fish caught. CDFW's California Fishing Passport program again joins the International Game Fish Association and the United Pier & Shore Anglers of California for their Young Angler Tournament series event, to be held at Trinidad Pier in Humboldt County. Youth from throughout the Humboldt and Del Norte Counties attend this fun event. CDFW's California Fishing Passport program gives each participant a California Fishing Passport, an California Finfish and Shellfish Identification book, and stamps for each of the different species caught. Trophies are awarded to the winning anglers in each age group. A free hot dog lunch is provided to each participant and lots of raffle prizes will be given away during this fun day of fishing on the northern California coast. The time has changed. The event will now begin at 1:00 pm. CDFW's California Fishing Passport Program joins hosts "Friends of Rollo" for another trip aboard the F/V Dana Pride out of Dana Wharf Landing in Dana Point. "Friends of Rollo" is a non-profit organization headquartered in San Diego with a charter to introduce more kids and families to ocean fishing adventures through a complimentary deep sea fishing trip. CDFW's Fishing Passport staff will be there equipped with California Fishing Passports for everyone, and stamps for each fish caught. "Friends of Rollo" have helped take more than 100,000 kids out fishing! This annual salmon festival is a free, fun-filled day loaded with lots of fishing activities and fascinating information about California salmon. The festival runs 9:00 AM to 4:00 PM. California Fishing Passports are provided to all attendees and fishing passport stamps are given for each new species caught. Open to everyone! For more information, please call (530) 365-8622. CDFW's California Fishing Passport Program partnered with non-profit Friends of Rollo and NOAA Fisheries to take 35 underprivileged children out for a day of fishing on the F/V Dolphin and to recognize the 100,000th child served through the Friends of Rollo kids fishing program. The (36th) annual Port of San Diego's "Day at the Docks" is the West Coast's largest public celebration of sport fishing and signals the official start of Southern California's spring saltwater fishing season. A San Diego sport fishing tradition, Day at the Docks is held each year against the colorful and dynamic backdrop of the world-renowned sport fishing fleet on San Diego Bay, and attracts tens of thousands of fishing enthusiasts and families to the sport fishing landings in Point Loma. Three ponds are stocked with trout and there are volunteers to help with questions about fishing. Participants are required to be 15 or younger and able to hold a rod and reel. Free bait and limited loaner tackle are available, as well as food and concessions. New to the Mammoth Lakes area, "Trout Fest" is a free, fun-filled day loaded with lots of fishing activities and fascinating information about California native trout. California Fishing Passports are provided to all attendees and fishing passport stamps are given for each new species caught. Open to everyone! For more information, please call (559) 765-4824. "Fish for Life!" is a wonderful non-profit organization headquartered in Southern California with a charter to enhance the lives of special needs individuals by inviting them out on the water to enjoy a complimentary half-day deep sea fishing trip. CDFW's California Fishing Passport Program joins them aboard the F/V Dana Pride out of Dana Wharf Sportfishing equipped with California Fishing Passports for everyone, and stamps for each fish caught. These "Fish for Life!" trips are some of the most unique and special events held all year. This organization is designed to provide love and inspiration to a multitude of special needs people while teaching fishing skills and ministering to the value of life. Their motto: "We're Spreading the Love One Boat at a Time!" Three ponds are stocked with trout and there are volunteers to help with questions about fishing. Participants are 15 or younger and able to hold a rod and reel. Free bait and limited loaner tackle are available, as well as food and concessions. The 28th Annual Kid's Fishing Festival was again held in the high Sierras community of Mammoth Lakes at Snowcreek Resort on Saturday, July 26 from 8am to 2pm. As always, this California Fishing Passport event hosted by the Town of Mammoth Lakes is completely free. The trout catching is limited to kids 14 years of age and under but there is a full menu of events for everyone. More than 1,000 kids attend each year and nearly every child catches a big fish! Loaner rods and reels are provided by CDFW's Fishing in the City program at no charge. Berkley provides the bait, along with tackle for raffle prizes. Local guides and other fishing experts are on scene providing a helpful hand for all who need it. Prizes for the largest fish and raffle prizes were awarded. This is another great outing for families in the Eastern Sierras! Three ponds are stocked with trout, and volunteers help with questions about fishing. Participants are 15 or younger and able to hold a rod and reel. Free bait and limited loaner tackle are available, as well as food and concessions. The California Fishing Passport Program again joins forces with the International Game Fish Association and the San Diego Sportfishing Council to host the 12th annual day of pier fishing from the Shelter Island Pier in San Diego. The event runs from 8:00 am – 1:00 pm. More than 200 kids (15 years and younger) and their families come out for this festive annual event. Free lunches are served to all. Trophies are awarded to winners in every age group, along with fishing rods, reels and tackle donated by sponsors. California Fishing Passports and California Finfish and Shellfish Identification books are provided to all participants, and passports are stamped for each type of fish caught. It's always a great event for young kids and families to all participate in together. The 52nd Huck Finn Fishing Derby will be held at the Huntington Beach Pier. This is always a fun event and continues to be one of our favorites to support each year. Seeing all of the kids fishing while cleverly dressed up as Huck Finn or Becky Thatcher is a real highlight. Last year's event brought in more than 600 kids and their families. All types of saltwater fish have been caught over the years including; sharks, stingrays, perch, croakers, sea bass, lizard fish, topsmelt, and sardines! The event is open to children between the ages of 4 and 15 to experience the fun of recreational fishing off the Huntington Beach Pier. CDFW provides loaner rods and bait, California Fishing Passports, passport stamps and California Finfish and Shellfish Identification books. Prizes are given to both the largest and smallest fish caught, as well as the best dressed Huck Finn and Becky Thatcher participants. If you missed this special event last year, please try to attend this year. It's always a lot of fun for both children and adults alike. CDFW's California Fishing Passport program joins the International Game Fish Association and the United Pier & Shore Anglers of California for their Young Angler Tournament series event, held at Avila Pier. Youth from throughout the San Luis Obispo area attend this fun event. CDFW's California Fishing Passport program gives each participant a California Fishing Passport, an California Finfish and Shellfish Identification book, and stamps for each of the different species caught, which last year included sanddabs, croakers, and lizardfish. Trophies are awarded to the winning anglers in each age group. In addition to a free hot dog lunch and raffle prizes, goodie bags are distributed to each participant during this fun day of fishing on the central California coast. CDFW's California Fishing Passport Program joins hosts "Fish for Life!" and the Southern California Tuna Club for another fantastic trip aboard the F/V City of Long Beach out of Pierpoint Landing in Long Beach. "Fish for Life!" is a wonderful non-profit organization headquartered in Southern California with a charter to enhance the lives of special needs individuals by inviting them out on the water to enjoy a complimentary half-day deep sea fishing trip. CDFW's Fishing Passport staff will be there equipped with California Fishing Passports for everyone, and stamps for each fish caught. These "Fish for Life!" trips are some of the most unique and special events held all year. This organization is designed to provide love and inspiration to a multitude of special needs people while teaching fishing skills and ministering to the value of life. Their motto: "We're Spreading the Love One Boat at a Time!" 17th Annual Orvill P. Ball Memorial "Fishin' in the Pines"
This is a new event where CDFW's California Fishing Passport program joins the International Game Fish Association and the United Pier & Shore Anglers of California for their Young Angler Tournament series event, to be held at Trinidad Pier in Humboldt County. Youth from throughout the Humboldt and Del Norte Counties attend this fun event. CDFW's California Fishing Passport program gives each participant a California Fishing Passport, an California Finfish and Shellfish Identification book, and stamps for each of the different species caught. Trophies are awarded to the winning anglers in each age group. In addition to a free hot dog lunch and raffle prizes, goodie bags are distributed to each participant during this fun day of fishing on the northern California coast. The (35th) annual Port of San Diego's "Day at the Docks" is the West Coast's largest public celebration of sport fishing and signals the official start of Southern California's spring saltwater fishing season. A San Diego sport fishing tradition, Day at the Docks is held each year against the colorful and dynamic backdrop of the world-renowned sport fishing fleet on San Diego Bay, and attracts tens of thousands of fishing enthusiasts and families to the sport fishing landings in Point Loma. CDFW's California Fishing Passport Program partners with Fish for Life, Sportfishing Association of California (SAC), Mexico Port Commissioners, Friends of Rollo and others for an international goodwill fishing trip to take 30 underprivileged children from Mexico, along with a parent, out for a day of fishing. The 27th Annual Kid's Fishing Festival was again held in the high Sierras community of Mammoth Lakes at Snowcreek Resort on Saturday, July 26 from 8am to 2pm. As always, this California Fishing Passport event hosted by the Town of Mammoth Lakes is completely free. The trout catching is limited to kids 14 years of age and under but there is a full menu of events for everyone. More than 1,000 kids attend each year and nearly every child catches a big fish! Loaner rods and reels are provided by CDFW's Fishing in the City program at no charge. Berkley provides the bait, along with tackle for raffle prizes. Local guides and other fishing experts are on scene providing a helpful hand for all who need it. Prizes for the largest fish and raffle prizes were awarded. This is another great outing for families in the Eastern Sierras! CDFW's California Fishing Passport Program partners with Friends of Rollo and Wild Game Feed to take foster kids from "Boys Town" out for a fishing trip aboard the F/V Sum Fun out of Dana Wharf Sportfishing, equipping each angler with a California Fishing Passport, and stamps for each fish caught. This event is sponsored and produced by the San Diego Sportfishing Council and supported by the Int'l Game Fish Association of California (IGFA). This event is free for all children 6 to 15. Registration begins at 7:30 am and the contest begins at 9:00 a.m. All entrants receive a free goodie bag, loaner rods (if needed), and bait. Food and drinks are provided, plus Catalina Offshore are there cooking fish tacos for the young anglers. Fishing ends at 1:00 p.m. Prizes are awarded by age group for the numbers of fish caught and released. A perpetual trophy goes to the angler with the overall highest score. Volunteers from IFGA, various San Diego fishing clubs and members of the United Pier & Shore Anglers of California assist. In 2013, there were 165 young anglers competing. CDFW's California Fishing Passport program again joins the International Game Fish Association and the United Pier & Shore Anglers of California for their fifth Young Angler Tournament series event of the year at the Marin Rod and Gun Club Pier. Youth from throughout the San Francisco Bay Area attend this fun event. CDFW's California Fishing Passport program gives each participant a California Fishing Passport, an California Finfish and Shellfish Identification book, and stamps for each of the different species caught. Last year these included leopard sharks, sea perch and jacksmelt, among others. Trophies are awarded to the winning participants in each age group. In addition to a free hot dog lunch, donated prizes of rods and reels are distributed to each participant during this fun day of fishing on San Francisco Bay. The 51st Huck Finn Fishing Derby is held at the Huntington Beach Pier. This is always a fun event and continues to be one of our favorites to support each year. Seeing all of the kids fishing while cleverly dressed up as Huck Finn or Becky Thatcher is a real highlight. Last year's event brought in more than 600 kids and their families. All types of saltwater fish have been caught over the years including; sharks, stingrays, perch, croakers, sea bass, lizard fish, topsmelt, and sardines! The event is open to children between the ages of 4 and 15 to experience the fun of recreational fishing off the Huntington Beach Pier. CDFW provides loaner rods and bait, California Fishing Passports, passport stamps and California Finfish and Shellfish Identification books. Prizes are given to both the largest and smallest fish caught, as well as the best dressed Huck Finn and Becky Thatcher participants. If you missed this special event last year, please try to attend this year. It's always a lot of fun for both children and adults alike. 16th Annual Orvill P. Ball Memorial "Fishin' in the Pines"
The largest outdoor sportsmen's exposition in the north state, this is a very popular show and includes a free Youth Fair for kids 12 and under, including a large pond full of rainbow trout. Everyone who fished received Fishing Passports, the California Fin Fish and Shellfish Identification book. All anglers who successfully caught a fish also received a stamp in their passport books. The Fred Hall Long Beach Show is one of the top outdoor recreation shows around and features the largest selection of the nation's leading equipment manufacturers and industry leaders. It also includes trout fishing and casting lessons for the kids. This is the largest outdoor sportfishing show in Southern California. The Fred Hall Del Mar Show is a smaller version of the Long Beach show but also includes trout fishing and casting lessons for the kids. The 33rd annual Port of San Diego's "Day at the Docks" was a great success. It is the West Coast's largest public celebration of sportfishing and signals the official start of Southern California's spring saltwater fishing season. A San Diego sportfishing tradition, Day at the Docks is held each year against the colorful and dynamic backdrop of the world-renowned sportfishing fleet on San Diego Bay, and again attracted thousands of fishing enthusiasts and families to the sportfishing landings in Point Loma. The Northern California Dive and Travel Expo showcased travel opportunities close to home and worldwide, as well as many of the nation's leading scuba equipment manufacturers and industry leaders. It featured the latest gear, scuba clinics, events geared for children, and many talks and demonstrations given by interesting and inspiring world-renowned speakers. CDFW provided the latest information about California's red abalone population, a favorite with freedivers, and copies of the California Fishing Passport. Attendees were also able to get their California Fishing Passports stamped! "Women in the Outdoors" is an event sponsored by the National Wild Turkey Foundation and is designed just for women. Expert instructors taught outdoor skills, some of which included: fly fishing, spin fishing, shooting, archery, camping, primitive cooking, etc. The California Fishing Passport Program attends every year to support the many different fishing classes offered and provides attendees with fishing tips and to help interpret and explain the regulations for anyone needing help. This annual "Hooked On Fishing, Not On Drugs" event continues to be one of the largest single-day children's fishing events in the entire United States! The event draws well over 4,000 kids, plus an estimated 2,000 adults. Kids 14 and under were invited to Horseshoe Lake in Upper Bidwell Park for a chance at the 8,000 pounds of channel catfish that were planted for the event. By the end of the event, only about half of them had been caught. The rest provided fishing opportunities for local kids for the rest of the summer. The young anglers received CDFW's California Fishing Passports and California Finfish and Shellfish ID books and got their passports stamped. Admission was FREE, along with all tackle, bait and instruction. Kids even got their catfish cleaned for free. The Mt. Shasta Fish Hatchery stocked three ponds with trout for this fun annual event, and lots of volunteers were on hand to help with everyone's fishing questions. Free bait and loaner tackle was also available for whoever needed it. A lot of trout were taken during the event and the children were limited to two fish each. California Fishing Passports were provided to all attendees, and fishing passport stamps were given for each new species caught. This event was the first of the 2013 Young Angler Tournament series, held at the iconic 3,000 foot-long Berkeley Pier on San Francisco Bay. Historically, the Berkeley Pier ranks as the first of more than 120 public piers built in California. The event was free to the public and co-sponsored with the International Game Fish Association (IGFA) and the United Pier & Shore Anglers of California (UPSAC). CDFW's California Fishing Passport program gave each participant a California Fishing Passport and California Finfish and Shellfish Identification book, and stamped passports for each of the different species caught. Some of those included: black perch, walleye surfperch, jack smelt, bat rays, smoothhound sharks, bullheads, as well as a few crabs that were thrown back. The winners of each age group won trophies and other prizes. In addition to catching fish, participants were provided lunch and enjoyed a raffle as part of their fun day of fishing. Monterey Bay Youth Outdoor Day was a totally free event open to the public. The focus was to get kids interested and involved in the many outdoor activities available right in our own back yards. CDFW's California Fishing Passport program quizzed kids on different aspects of sportfish and fishing, gave attendees California Fishing Passports and California Finfish and Shellfish Identification books, and provided fishing, hunting and wildlife viewing information. With over 40 different organizations represented, there was something for everyone! New to the Mammoth Lakes area, "Trout Fest" was a free, fun-filled day loaded with lots of fishing activities and fascinating information about California native trout. California Fishing Passports were provided to all attendees and fishing passport stamps were given for each new species caught. Kids and their parents attended this event, which was so successful that we expect it to be back again next year. Mount Shasta Fish Hatchery, Mount Shasta The Mt. Shasta Fish Hatchery stocked three ponds with trout for this fun annual event, and lots of volunteers were on hand to help with everyone's fishing questions. Free bait and loaner tackle was also available for whoever needed it. A lot of trout were taken during the event and the children were limited to two fish each. California Fishing Passports were provided to all attendees, and fishing passport stamps were given for each new species caught. This annual event was held as a fundraiser for the Salmon Restoration Association, which helps to fund watershed restoration efforts. Attendees learned about salmon habitat restoration and other local conservation efforts, and indulged in some fish printing! Hundreds of attendees from all over northern California came out to contribute to a worthy cause, eat great BBQ, and listen to some fun music. CDFW's California Fishing Passports were provided and stamped! The International Game Fish Association, the United Pier & Shore Anglers of California and Fish Talk Radio joined together to host this new summer fishing derby held on California's oldest working wharf, Stearns Wharf in Santa Barbara. California Fishing Passports and fish ID books were given to each participant. This was a free event and loaner fishing gear and tackle as well as bait was provided. Special trophies and awards were presented to youth in each age group. In addition to catching fish, participants were provided lunch and enjoyed a raffle as part of their fun day of fishing. "Fish for Life!" is a wonderful non-profit organization headquartered in Southern California with a charter to enhance the lives of special needs individuals by inviting them out on the water to enjoy a complimentary half-day deep sea fishing trip. CDFW's California Fishing Passport Program joined them aboard the F/V Dana Pride out of Dana Wharf Sportfishing equipped with California Fishing Passports for everyone, and stamps for each fish caught. These "Fish for Life!" trips are some of the most unique and special events held all year. This organization is designed to provide love and inspiration to a multitude of special needs people while teaching fishing skills and ministering to the value of life. Their motto: "We're Spreading the Love One Boat at a Time!" The 26th Annual Kid's Fishing Festival was again held in the high Sierras community of Mammoth Lakes at Snowcreek Resort. As always, this California Fishing Passport event hosted by the Town of Mammoth Lakes was completely free. The trout catching was limited to kids 14 years of age and under but there was a full menu of events for everyone. More than 1,000 kids attended and nearly every child caught big fish! Loaner rods and reels were provided by CDFW's Fishing in the City program at no charge. Berkley provided the bait, along with tackle for raffle prizes. Local guides and other fishing experts were on scene providing a helpful hand for all who needed it. Prizes for the largest fish and raffle prizes were also awarded. This was another great outing for families in the Eastern Sierras! The California Fishing Passport Program again joined forces with the International Game Fish Association and the San Diego Sportfishing Council to host the 11th annual day of pier fishing from the Shelter Island Pier in San Diego. More than 200 kids (15 years and younger) and their families came out for this festive annual event. Free lunches were served to all. Trophies were awarded to winners in every age group, along with fishing rods, reels and tackle donated by sponsors. California Fishing Passports and California Finfish and Shellfish Identification books were provided to all participants, and passports were stamped for each type of fish caught. It's always a great event for young kids and families to all participate in together. The 51st Huck Finn Fishing Derby held at the Huntington Beach Pier was again a fun and successful event and it continues to be one of our favorites to support each year. Seeing all of the kids fishing while cleverly dressed up as Huck Finn or Becky Thatcher is a real highlight. This year's event brought in more than 600 kids and their families and was open to children between the ages of 4 and 15 to experience the fun of recreational fishing off the Huntington Beach Pier. CDFW provided loaner rods and bait, California Fishing Passports, passport stamps and California Finfish and Shellfish Identification books. Prizes were given to both the largest and smallest fish caught, as well as the best dressed Huck Finn and Becky Thatcher participants. If you missed this special event this year, please try to attend next year. It's always a lot of fun for both children and adults alike. CDFW's California Fishing Passport program again joined the International Game Fish Association and the United Pier & Shore Anglers of California for their fourth Young Angler Tournament series event of the year at the Marin Rod and Gun Club Pier. This year, the event was held in conjunction with the club's Kid's Day on the Pier. Youth from throughout the San Francisco Bay Area attended this fun event. CDFW's California Fishing Passport program gave each participant a California Fishing Passport, an California Finfish and Shellfish Identification book, and stamps for each of the different species caught, which this year included leopard sharks, sea perch and jacksmelt among others. Trophies were awarded to the winning participants in each age group. In addition to a free hot dog lunch, donated prizes of rods and reels were distributed to each participant during this fun day of fishing on San Francisco Bay. Dana Wharf Sportfishing and the F/V Dana Pride were hosts for a special half-day of deep sea fishing with Great Opportunities, a unique non-profit organization that benefits under-privileged children from heavily gang-oriented neighborhoods in Orange County. This organization tries to give them the support, tools and opportunities they need to see their potential and understand that they can achieve anything if they believe in themselves. CDFW's California Fishing Passport program again supported this trip with California Fishing Passports, California Finfish and Shellfish Identification books, and stamps for each species of fish caught. Again this year, 75+ children and group leaders attended. For many, it was their first adventure on the ocean, and most likely not their last. This is a free kids derby open to kids up to age 15. Trout fishing starting at 6:00 a.m. and a free lunch will be prepared by the San Diego Anglers club. The event is sponsored by the Lake Cuyamaca Recreation and Park District, 15027 Highway 79, Julian, CA 92036. CDFW's California Fishing Passport will again join the non-profit organization "Fish for Life!" aboard the F/V Dana Pride out of Dana Wharf Sportfishing for a day of fishing. "Fish for Life!" is headquartered in Southern California with a charter to enhance the lives of special needs individuals by inviting selected groups to enjoy a complimentary half day fishing trip on the sea. This program is designed to provide love and inspiration to a multitude of special needs people while teaching fishing skills and ministering to the value of life. Their motto: "We're Spreading the Love One Boat at a Time!" This first event of the Young Angler Tournament series at the Berkeley Pier on San Francisco Bay was co-sponsored by the International Wildlife Fish Association and the United Pier & Shore Anglers of California. DFG's California Fishing Passport program joined in to give each participant a passport, which was stamped as they caught different kinds of fish. Dozens of kids showed up to participate, catch fish, win prizes and generally have a great time! DFG's Fishing Passport staff joined IGFA/UPSAC at their second Young Angler Tournament series event at Avila Pier. The event was co-sponsored by the International Wildlife Fish Association and the United Pier & Shore Anglers of California. Young anglers caught lots of interesting fish, won prizes and generally had a great time! This annual event is a fundraiser for the Salmon Restoration Association, which helps to fund watershed restoration efforts. Hundreds of attendees from all over northern California come to contribute to a worthy cause, eat great BBQ, and listen to some fun music. You can also pick up a copy of the California Fishing Passport and get your passport stamped! DFG's California Fishing Passport program joined the International Wildlife Fish Association and the United Pier & Shore Anglers of California at their third Young Angler Tournament series event at the Marin Rod and and Gun Club pier. Youth from throughout the SF Bay Area attended this fun event. 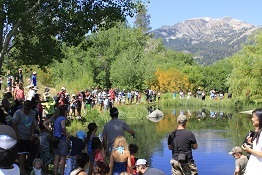 The 25th Annual Kids Fishing Festival was held in Mammoth Lakes on Saturday, July 28, 2012. As always, this California Fishing Passport event was completely free. More than 1,000 kids attended and nearly every child caught fish! This was another great outing for families in the Eastern Sierras! The Junior Angler Fishing Derby series came to the Oceanside Pier in Oceanside on Aug. 4. It was a beautiful warm and sunny day. At least 125-150 kids (up to 15 years old) came out for the derby. Prizes were given to anglers in each age group, as well as lots of raffle prizes to all entrants. Partners for this event included: DFG's California Fishing Passport Program, International Wildlife Fish Assn., United Pier and Shore Anglers Club and the National Oceanic and Atmospheric Administration. On August 4, more than 1,000 children attended this popular trout fishing event at the Mt. Shasta Hatchery. A California Fishing Passport trip aboard the F/V Dana Pride with "Great Opportunities", a wonderful non-profit organization that benefits under-privileged children from heavily gang-oriented neighborhoods in Orange County. This organization tries to give them the support, tools and opportunities they need to see their potential and understand that they can achieve anything if they believe in themselves. A total of 80+ children and group leaders attended. For many, it was their first adventure on the ocean. The California Fishing Passport Program joined forces with the International Wildlife Fish Association and the San Diego Sportfishing Council to host a day of pier fishing from the Shelter Island Pier in San Diego. More than 200 kids (15 years and younger) and their families came out for this festive annual event. Free lunches were served to all and fishing rods, reels and tackle as well as trophies were given to winners in every age group. All prizes were donated by sponsors. It was a great event for young kids and families to all participate in together. DFG's California Fishing Passport joined the non profit organization "Fish for Life!" aboard the F/V Dana Pride out of Dana Wharf Sportfishing for a day of fishing. "Fish for Life!" is headquartered in Southern California with a charter to enhance the lives of special needs individuals by inviting selected groups to enjoy a complimentary half day fishing trip on the sea. This program is designed to provide love and inspiration to a multitude of special needs people while teaching fishing skills and ministering to the value of life. Their motto: "We're Spreading the Love One Boat at a Time!" DFG's California Fishing Passport joined the non profit organizations "Fish for Life!" and SeniorWish to honor WW11, Korean War and Desert Storm veterans aboard the F/V Dana Pride out of Dana Wharf Sportfishing for a day of fishing. A total of 35 veterans (most in their 80's and a handful in their 90!) attended. It was a great day of fishing and a special event to honor and thank our veterans for their service to our country.